On this day a decade ago, Florida’s history changed one more time for the second time in less than 24 hours. Just the day before Tropical Storm Bonnie – the forgotten storm of the very busy 2004 Atlantic Hurricane Season – made landfall just south of Apalachicola bringing with it rainfall and a tornado in Jacksonville. For the most part Bonnie was known better in the Carolinas and mid-Atlantic states for its tornado outbreak and three deaths. This system went unknown to me as a high school freshman that had just started high school a week or two before. 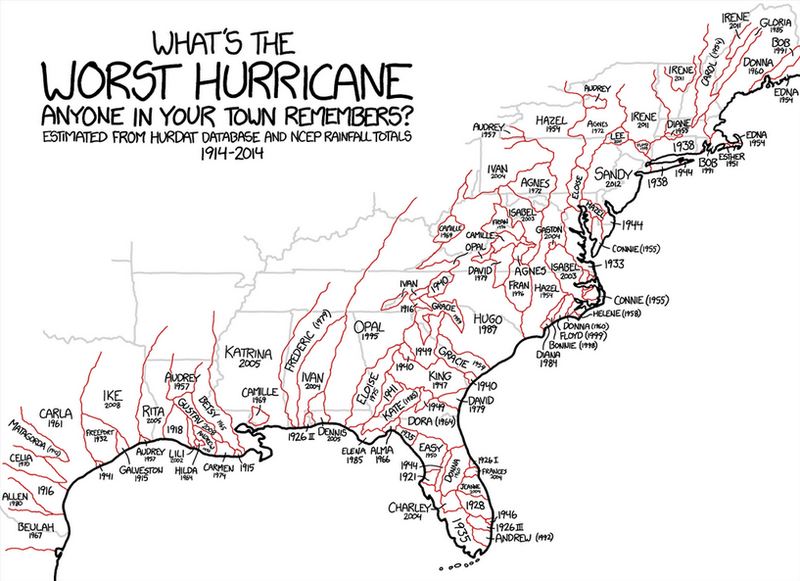 I had just moved to Florida at the end of the 2003 Hurricane Season, and I had no idea what hurricanes or tropical storms were, and I had not began studying tropical systems until the next day. I was used to the blizzards and snow squalls that were normal in the Finger Lakes of New York and some strong storms each summer. Nothing really prepared me or my family for what the 2004 season had coming. This Friday the 13th was going to be different. 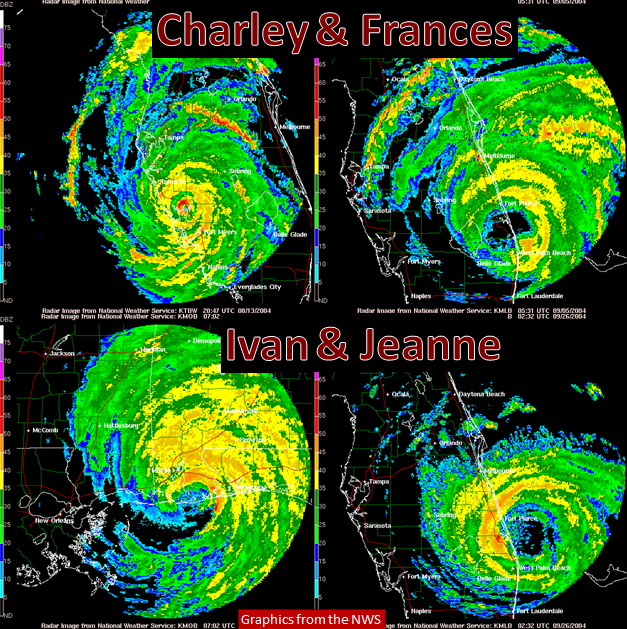 Tracks of Tropical Storm Bonnie and Hurricanes Charley, Frances, Ivan, and Jeanne. To this day, my memories of that day consisted of ABC news coverage in Tampa Bay, holding my house together with tape (don’t do this! ), and hours of wind and waiting. In my consciousness, this storm came with warning from a few days back as people around me began to prepare for something I had not ever heard of. Luckily this storm arrived with daylight and a name: Charley. I knew that a “4” was a high number for hurricanes, and this could be the worst hurricane for the area. The worst storms in the Empire State that I had gone through gave us feet of snow and days off from school…both good things in my mind. School was called off for Charley that day. Then Denis said the radar was showing that Charley had turned and my area was going to be better off. I was being told to hunker down by Don Germaise…a phrase I repeat to this day. The first of four hurricanes to make landfall or bring devastating impacts to Florida was about to bear down on Punta Gorda and all the way to Orlando. Even the happiest place on Earth was closed on that day. This was the storm that created my passion for meteorology…or the weather as I know it. It took hours of holding out plastic windows in what we called our Florida room to realize what these storms were made of. To this day I continue to correct people on the way to spell Charley as if he was a great friend for really no reason at all. Less than a month later, Frances was knocking on Florida’s door once again. It wasn’t until years later than I got a cell phone or internet like we have today. My interest in this storm was more intense, but still I watched through The Weather Channel and local news. Each hurricane had its own personality and I have learned through the years to key in on those “personalities” as storms approach to see how the impact will be. Again, this was the age of news coming from stations rather than phones, far away radio stations, and internet from everywhere. Most of what I remember is from the news, newspapers, personal interaction, and what I have learned since. Charley ended up being a very lucky day out of school for me. We had gusty winds and some rain, but I realize now that it could have been MUCH worse had it not turned. It was a very small bundle of energy that knew where it wanted to go. In the Hurricane bunch, this was the little brother with big might that hadn’t quite figured out all of its tricks. Thankfully surge was one of those tricks it had not well figured out. 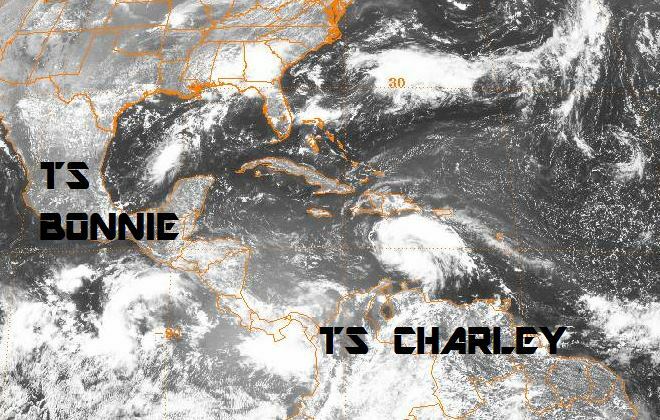 Charley could have been the one that replaced the 1921 Hurricane for Tampa Bay. Frances and Jeanne were like those two sisters that are so alike that it is hard to tell them apart. In my recollection of them, I cannot tell them apart either. Jeanne was the extra dizzying or drunkard energy that swirled in the Atlantic and where it stopped we only found out at the end. Frances was more introspective and reserved, but it knew where it wanted to go. Their paths nearly coincided from the east coast all the way to the nature coast. By this point, I am sure that Polk County and the communities of Fort Meade, Homeland, Alturas, and Lake Baffum were thinking enough is enough. Charley, Frances, and Jeanne all passed through those areas in less than 45 days. 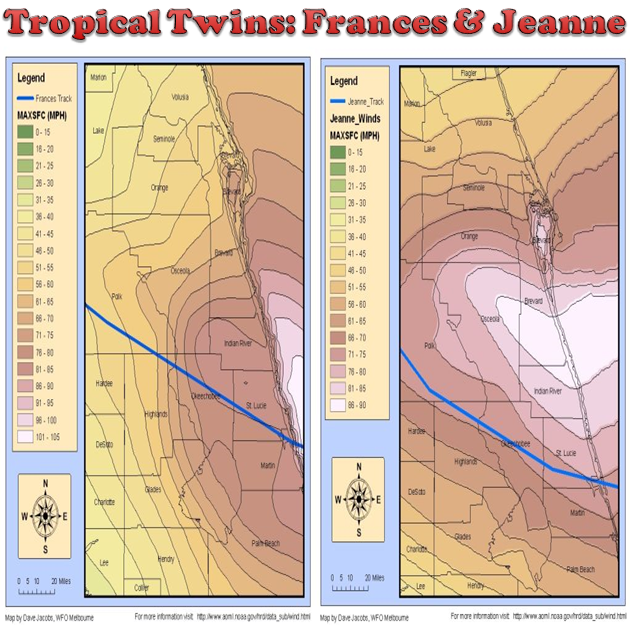 Jeanne brought numerous impacts that Charley did not including moderate to heavy rain and stronger winds on the west coast of Florida. Ivan was known for his full tool belt, but especially his waves and surge. 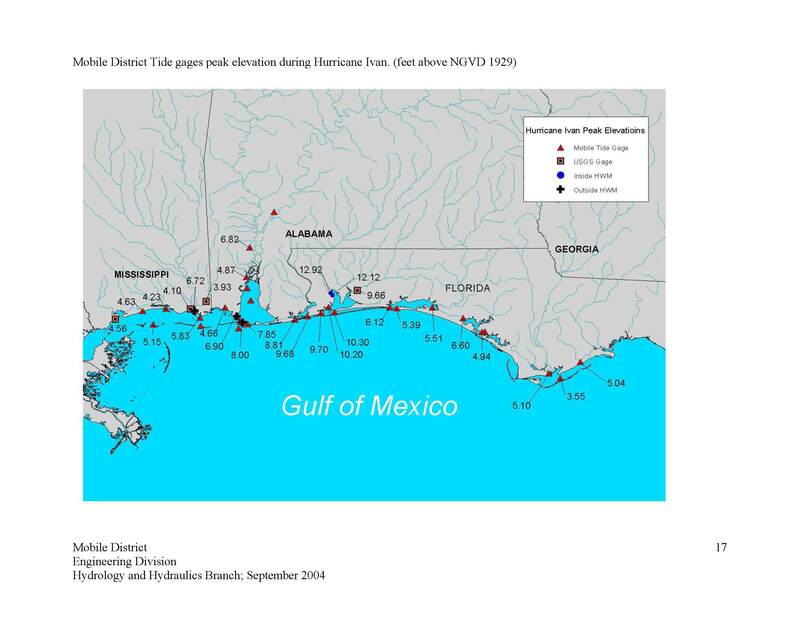 Scientists at NRL have estimated that waves in Hurricane Ivan could have gotten up to 131 feet, and were observed above 50 feet off the shores of numerous countries. Ivan brought hurricane force winds to Alabama and NW Florida as it made landfall as a category 3. Ivan was the strongest/deepest storm in terms of pressure as well. Ivan took on the name of Ivan The Great or Ivan the Terrible, and it fit. …And then it came back. Ivan was a rare case that moved up the east coast, and then came back to Florida and then moved toward Texas the long way. Radar technology and technology in general has changed considerably in the last decade. We now have Dual Pol radar across the country that gives us entirely new variables to see graupel – which is somewhat common in intense hurricanes and rapidly intensifying hurricanes – and the birds that circulate in the eyes of hurricanes some times. We saw birds in the eye of Arthur just this year with this technology. Rapidly updating radar and better scan techniques such as SAILS and AVSET have been adopted. Rapid Scan Operations and Super Rapid Scan Operations allow us to see hurricanes in near real-time on satellite. As we saw this week with the supermoon, hurricanes that used to be invisible to visible imagery over night can now be seen with the right lunar conditions with nighttime visible imagery. Phased array radar is being developed and could be common place in the next 10 years, which may allow us to focus in on hurricanes as they move ashore. We continue to get new space images from the ISS and from new satellites. New “space radar” technology has allowed us to see what ground based radar would look like in 3D. The TRMM has allowed us to do that most recently with Precipitation Radar from NASA. We unfortunately lost a good chunk of data from QuikScat in 2009, which has limited our wind information in the open waters. ASCAT has helped cover what has been lost when QuikScat stopped reporting accurate information. New wind and ocean scatterometers are planned by 2020. Launch of the ISS-RapidScat is planned for this year, but data may take years to appear publicly. Microwave imagery continues to evolve with new satellites every few years. Hurricane Ivan as seen by QuikScat in September 2004 from NASA. The way that we warn of hurricanes and receive information about hurricane approaches has changed. 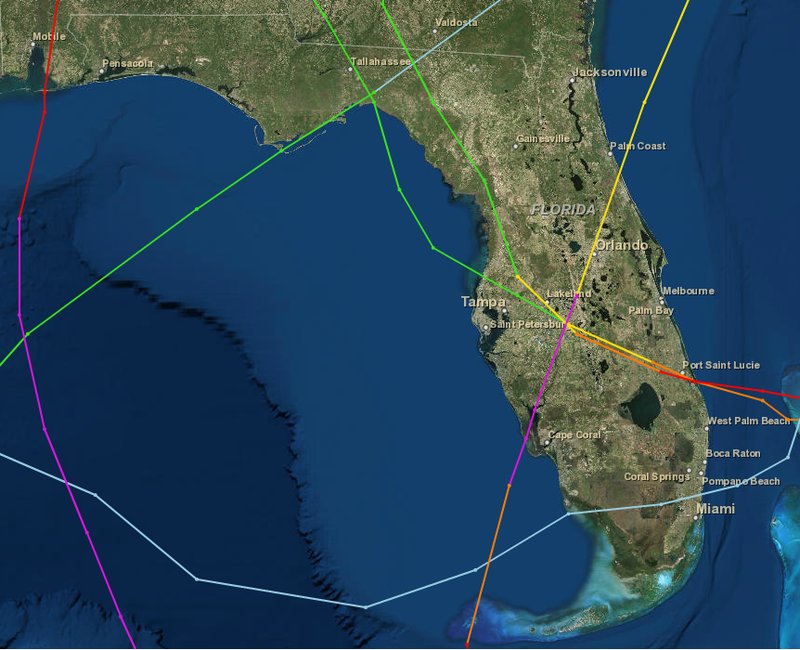 Many of us have exchanged the tracking maps that I used to track the 2005 hurricane season for mobile applications and fantastic networks and websites. We get warnings instantly through Weather Emergency Alerts and our other apps. The way that warnings are issued has changed. They are no longer coastal only warnings used for evacuation. They are also issued for post-tropical systems following Sandy. The amount of area included in coastal warnings has been reduced as track and intensity forecasting has improved. Storm surge warnings are coming in the next few years. The backup agency for the National Hurricane Center has changed names to the Weather Prediction Center even though I continue to type HPC into my browser. The scales that rates tornadoes and hurricanes in the United States and Atlantic basin have changed. In 2007, the Fujita damage estimator scale that rates tornadoes got an enhancement with better research information. 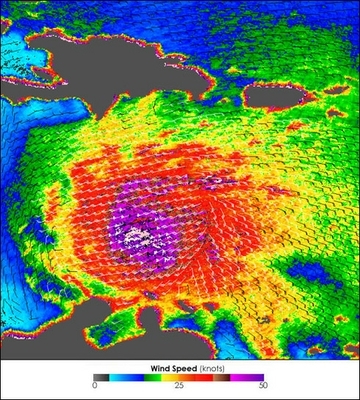 The Saffir-Simpson Hurricane Scale got reduced to a wind scale in 2009, and got another update in 2012 to better reflect units used on the waters, in the air, and in most parts of the world. 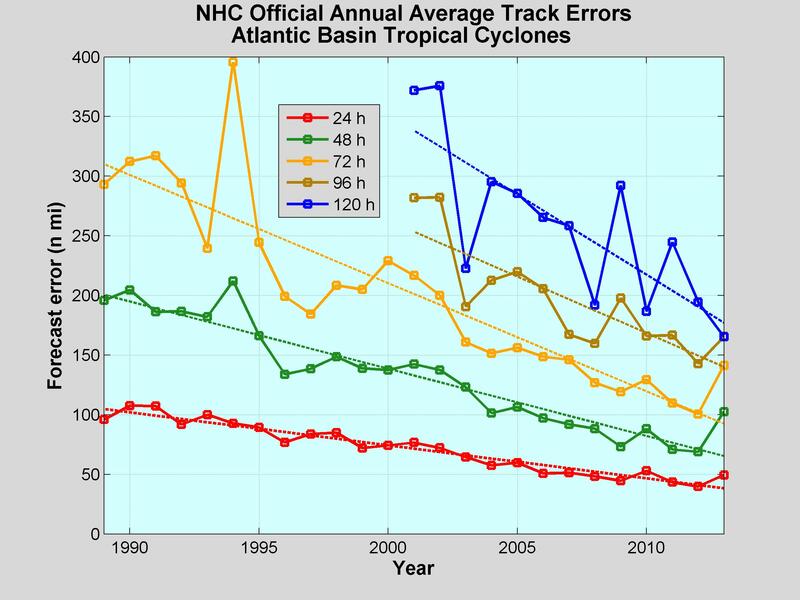 the Saffir-Simpson Hurricane Wind Scale no longer reflects pressure or surge estimates since the public was misreading the scale and basin their evacuations on surge. Charley showed us that a category 4 can come with very little surge, but Ike showed us that a category 2 can arrive with very large surge. Continual research is being done at research universities around the world. Continual research continues from the Hurricane Hunters from both NOAA and the Air Force. This research has driven down model error rates in both track and intensity. All of the models have been upgraded in the last decade, and new models are being developed. HRRR will go operational next month for near shore and on land cyclones. Unfortunately, intensity models have not improved nearly as much as track models. 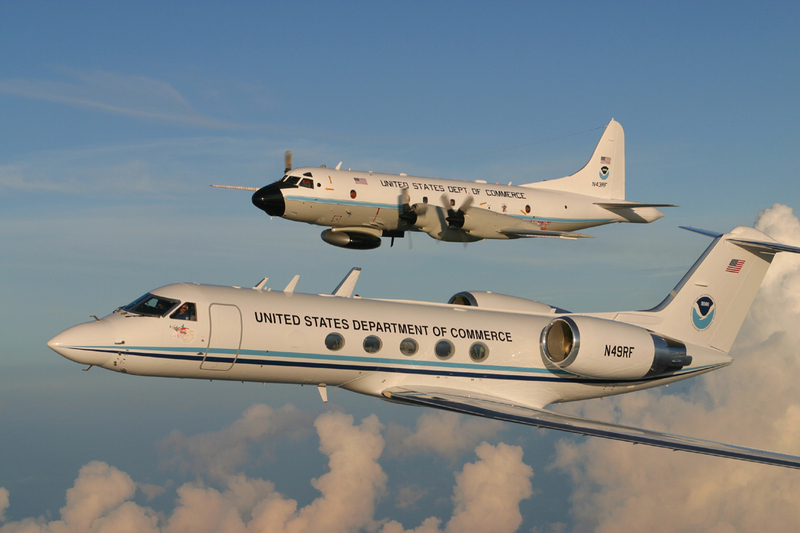 NOAA’s Hurricane Hunters. Image courtesy NOAA. Economic downturn as of late has left many hurricane hit homes around the world in either foreclosure or in abandonment. This may leave future communities at risk of further damage from hurricanes. Building codes and preparedness activities have increased the safety of our homes and personal well-being, but more needs to be done by all of us. Coastlines have changed since 2004 with numerous hurricanes and tropical storms since then. 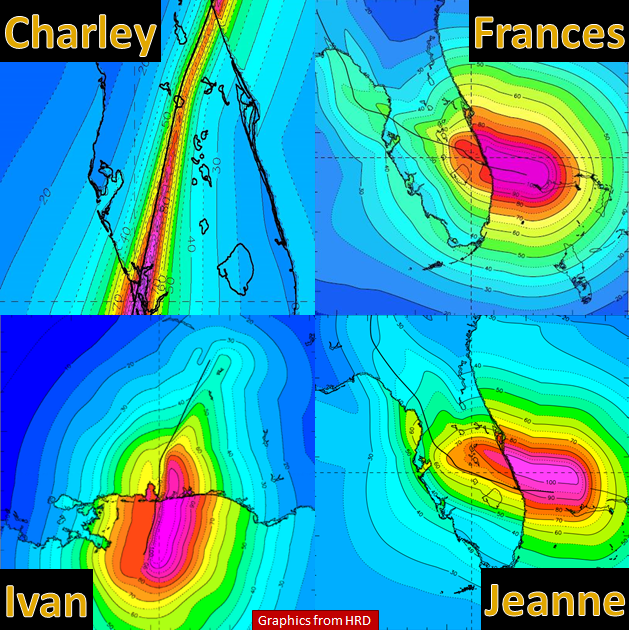 Charley caused a split in North Captiva Island and that passageway between the two islands has gained the name Charley Pass. That was due to Charley’s surge, which was minimal. Other more tremendous surge events have changed other coastlines for sure. Rebeaching continues on the west coast of Florida after each tropical cyclone that passes through. I believe the multi-decadal active phase of tropical activity in the Atlantic has ended somewhere in the last 4 years. Preparedness activities have changed. We no longer tape windows like we did back then. We now board windows up and add hurricane netting. Hurricane poles are being put up in some communities to show how high surge can go, and evacuation techniques continue to be improved. “The First 72 Is Up To You” is a campaign that still needs to be spread, but it has made good headway to get people prepared. In my opinion, we are still waiting too long to prepare. All four hurricanes remain in the top 15 costliest hurricanes list from the National Hurricane Center. These storms totaled up to $55.91 Billion USD in damage. Hurricane Ivan caused a billion USD in three separate countries. The four hurricanes amassed 3,248 deaths in the basin with Jeanne topping the deadliest hurricane list at the #3 spot since the 70s. Most of these deaths from Jeanne came from Haiti and the Dominican Republic. We all have to take a part in preparing for storms of any intensity. Technology will evolve around us, but it is our job to keep up with it. Soon there will be an improved cheap version of plywood and cheaper ways of keeping ourselves safe, but we will still have to invest in our future. We still have to ask the dumb questions when storms threaten so that everyone will get answers. Continuing into my second decade of hurricane experiences, I hope you’ll join me in learning everything there is to learn about tropical cyclones and the social science needed in preparing for these beasts. This journey cannot be done alone. The next decade will be both interesting and frustrating, and I hope all of you will be with me if/when I write the 20 year anniversary post. I encourage you to open up each graphic above if you haven’t already to learn something new. Special thanks to the NWS Miami, NWS Tampa Bay, NWS Melbourne, NWS Mobile, David Roth, NASA, the NHC, and FL Department of Environmental Protection for their information, graphics and websites. Share your experiences with me on twitter @JonathanBelles or in the comments below. Thank you for reading!!! Have a good day (Vietnam – RIP Robin)! Posted on Wednesday, August 13th, 2014, in Florida Weather, Tropical Weather and tagged 2004, Charley, Cyclone, Frances, Hurricanes, Ivan, Jeanne, Tropical. Bookmark the permalink. 1 Comment.